Remember when we got married? Your clothes were more expensive than mine. 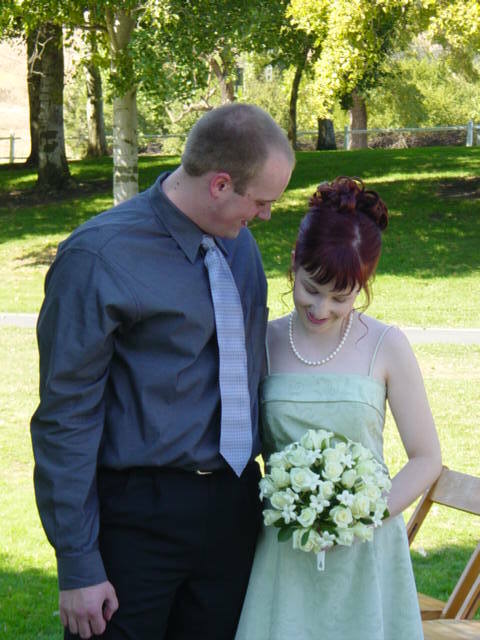 My $20 dress and bright red hair and our happy nerves all bunched together. My favorite was our little dance in your parents living room and smiling up at you. I've been trying to think of the happy moments in life. Good things have happened to me. Mainly you. Also our home, our puppies, and that we can afford therapy and healthcare. It's those things that keep me bound up in some jittery way of life. I love that I have way too much nail polish. Loads of shoes (even though Cricket ate my favorite pair yesterday). I have books to last me years and all the tech-y gadgets I can imagine. I watch the same disney movies every night while falling asleep and you don't act sick of them (although I'm sure you are). You let me overload the living room with my desk and art space. Our house is full of collages of what I love, and things I have made. Our bedroom is deep green and pink with pink party poms hanging from the ceiling, but you don't mind much--because it's me. You like me. The few-freckled mess of a girl, with new and old scars, lots of moods, enough pajamas to clothe a small village (and I wear them constantly). You don't need me dolled up, I don't have to act for you. I'm scared of you because you really love me, and I don't know how to take that. Because no one has really loved me for exactly who I am. You don't want me to change. Nine years later, and I still can't comprehend your love for me, sometimes that hurts and keeps me from being myself. I feel in trouble when I'm with you because this is too good to be true. Life is too easy in regards to you, it's unsettling. Anyway, just thought I would say. What a beautiful post with a beautiful photo to match. You're clearly lucky to have found each other. You two are very lucky to have each other. And I love this sweet picture of y'all. :) that is so sweet. He's lucky to have you.